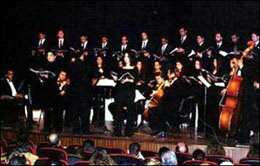 The “Choeur des Trois Cultures” (Choir of the Three Cultures), a musical group created in Spain, performed on Tuesday in the Rabat-based national theatre. “Choeur des Trois Cultures”, was founded in Seville thanks to the determination and involvement of the Fondation des Trois Cultures (Foundation of the Three Cultures). The group is made up of singers of different nationalities and religions. On Tuesday, they performed works in Arabic, Hebrew and Latin. André Azoulay, president delegate to the “Choeur des Trois Cultures” foundation, also counselor of HM King Mohammed VI, told a press conference that culture is the best medium to promote dialogue in the highly complex Euro-Mediterranean social and political context. In the same vein, Gaspar Zarias, president of the foundation's committee, also advisor to the presidency of the Andalusian local government (Consejero de Presidencia de La Junta de Andalucía), expressed his satisfaction over the organization of this event. He added that the foundation enjoys international esteem because it has become an efficient mechanism for dialogue of civilizations. Zarias also said that the foundation's projects reached 53 in 2005-2006 and that its budget rose from Euro 1.9 million to Euro 3 million. The Foundation of the Three Mediterranean Cultures is a non-profit organization that in recent years has become the international benchmark for dialogue and respect to achieve peace and understanding amongst the people of the world, thanks to the exceptional nature of the patronage and its cultural activities. It was established in 1999 under the aegis of the Andalusian Regional Government and the Kingdom of Morocco, who in 1998 broached the need to create a forum to bring together the people of the Mediterranean. This proposal was favourably received by the international community, with the support of the Peres Centre for Peace, the Palestinian National Authority, and multiple Israeli and Euro-Mediterranean individuals and institutions committed to dialogue and peace. The Foundation is headquartered in the Hassan II pavilion in Seville, a magnificent building that once housed the pavilion of Morocco during the Expo '92 at the Isla de la Cartuja. Over the past seven years, this venue has become the space where Andalusia has promoted a broad range of public events aimed at fostering inter-faith, social, economic, cultural, and political dialogue, thus becoming a centre for greater understanding and tolerance, and friendlier relations in the Euro-Mediterranean region.